Rising star alert! LiveConnections has put together three of the brightest young string talents in the field to form a new ensemble, the Bird’s Eye Trio. 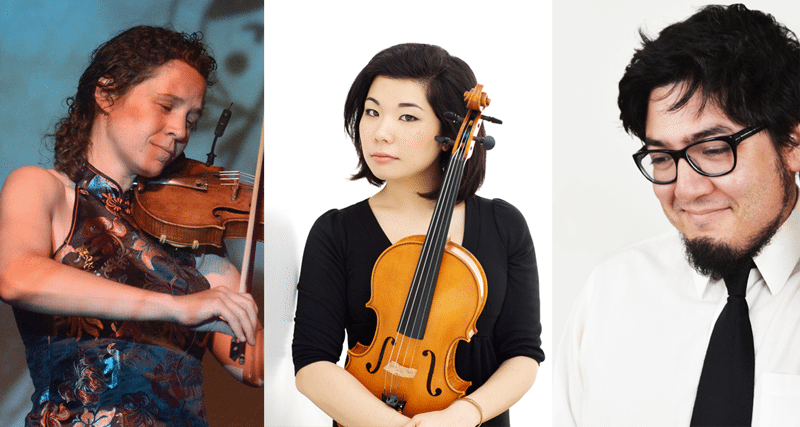 The program features original compositions by cellist Paul Wiancko and violinist Jennifer Curtis, joined by award-winning violist and Astral Artist Ayane Kozasa. Music spans from Beethoven to Wiancko’s “Sanguine Clockwork” to the world premiere of a folk-inspired work by Curtis. Violinist Jennifer Curtis navigates with personality and truth in every piece she performs. Her second solo concert in Carnegie Hall was described by the New York Times as “one of the gutsiest and most individual recital programs,” and she was celebrated as “an artist of keen intelligence and taste, well worth watching out for.” An improviser, composer, and multi-instrumentalist, Jennifer is a member of the International Contemporary Ensemble (ICE) and founder of the group Tres Americas Ensemble. She has appeared as a soloist with the Simon Bolivar Orchestra in Venezuela and the Knights Chamber Orchestra; performed in Romania in honor of George Enescu; given world premieres at the Mostly Mozart Festival in New York; collaborated with composer John Adams at the Library of Congress; and appeared at El Festival de las Artes Esénias in Peru and festivals worldwide. An educator with a focus on music as humanitarian aid, Jennifer has also collaborated with musical shamen of the Andes, improvised for live radio from the interior of the Amazon jungle, and taught and collaborated with Kurdish refugees in Turkey. Paul Wiancko has led an exceptionally multi-faceted musical life as a cellist, composer, collaborator and arranger. As a composer, one of Paul’s first large-scale compositions was a highly virtuosic concerto for cello, orchestra and electronics. Entitled “Tales From Bent City,” the piece blends Paul’s passion for hip-hop and improvisation with his love of the great 19th century late-romantic composers, and its New York premiere was hailed by Sequenza21 as “surprising, fun, fresh and even innovative.” Recent commissions include works for the Grammy-winning Parker Quartet, cellist Judith Serkin, violist Ayane Kozasa, pianist Clare Hammond and Barge Music in Brooklyn. Upcoming projects include scoring the new prison-drama feature film “Heartlock,” as well as a new Mars-exploration-based work for solo piano commissioned by scientist Dr. Peter Smith, the principal investigator for NASA’s Phoenix mission to Mars. For more information, visit http://www.paulwiancko.com.